The core reason is the mis-alignment of incentives. Integratively-oriented practitioners tend to believe that medical services will cost less. Insurers will be their new best friends. Yet the 80/20 rule in insurers’ business model perversely incents them – over time – against lowering costs. See the chart above. If you are an insurer, which level of premium do you prefer? So a practitioner focused on supporting lifestyle changes to reverse chronic disease who extends a hand to the insurance industry as a potential collaborator is likely to have a rude awakening. As the chart shows, as premiums go up, insurers – fundamentally financial institutions rather than healthcare organizations – the insurer’s piece of the pie engorges. Why would an insurer get into bed with those who promise to reverse these trends? Yet Beckman, an actuary with Central States Indemnity, in Omaha, Nebraska, is a rare bird. Personal experience with lifestyle medicine showed him that it could reverse his own chronic disease. As shared here, he developed a pilot with a Central States Medicare Supplement population that showed that a simple intervention consisting of little more than a film, a book, and a memo could significantly reduce the use of medical services. “The ROI was off the charts,” Beckman shared. He and like-minded colleagues decided to act. They co-founded Actuaries for Sustainable Health Care. He linked up with the American College of Lifestyle Medicine (ACLM) and its Economic Research Consortium Advisory Board. In the next 15 minutes, Beckman proceeded to lay out a scenario that, in concept, lived up to the billing of his webinar title. 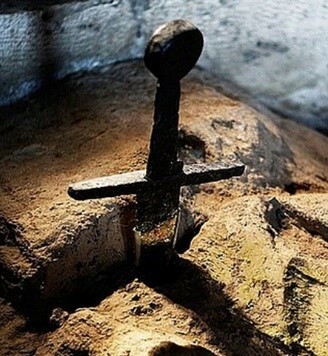 Beckman the Actu ary as King Arthur is plausible. All it takes is a little partner shifting, and paradigm shifting. The need to change partners is described above. Lifestyle-oriented medicine needs a large stakeholder ally who benefits from savings. If the big money in integrative medicine is not in producing more services and procedures but instead in doing less and saving money, aren’t employers and government agencies that purchase services more financially aligned with as integrative partners? Twenty years ago, employer leader Sean Sullivan, JD called this “integration from the demand side.” Beckman agrees: the optimal dance partners for lifestyle medicine practitioners are self-insurers employers and unions. Together, he notes, these plans cover over 120-million people. Beckman’s next step – the paradigm shift – evokes the story of the ancient Chinese doctors who get paid not for providing services but rather for keeping people healthy. Only for Beckman, the focus is not on “prevention” but the reversal of chronic disease. 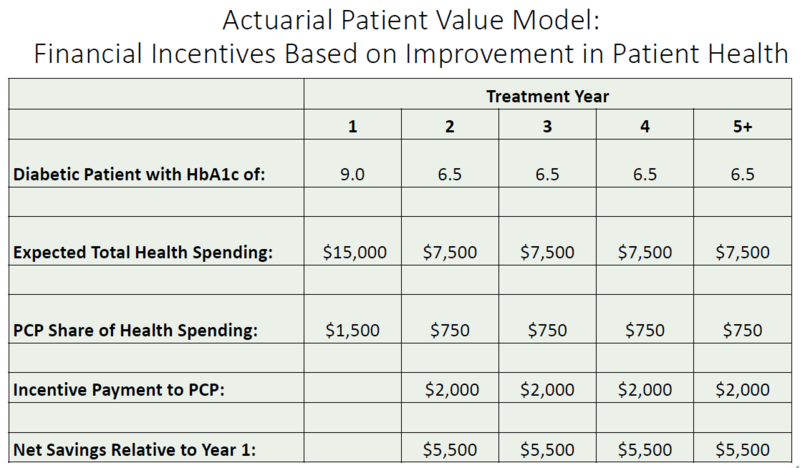 Using what he calls the “Actuarial Patient Value Model,” Beckman shows how hitting certain health targets converts to cost savings. For instance, a one-point drop in HbA1C “decreases annual healthcare spending by $3000” as averaged over a population. He estimated that a drop from 9.0 to 6.5 will reduce “expected total health spending” from $15,000 to $7500. If the blood sugar control continues to maintain, savings can sustain from year to year. As the chart shows, Beckman proposes that the primary care practitioner who achieves positive changes in patients should share in the savings. In the model, the practitioners keep their $750 for their “share of health spending” but in addition can receive $2000 — a 26.6% share – of the $7500 savings. Multiply this across a successfully treated patient population of 25 or 50 or 100 patients, and the potential earnings soar. Then add in similar, actuarially indicated savings for patients with other conditions and positive economics begin to glow. As do lifestyle practitioners’ abilities to break the economic shackles of the short visit and spend more time with patients. There is cash here to offer education, coaching, cooking classes, group services, home care, and other such practices that are optimally wrapped into a lifestyle practice. Beckman takes pains to share that these shared savings differ in a fundamental way from what one sees in accountable care organizations (ACO). Typical ACO measures on which bonuses are paid are from HEDIS and are process rather than outcomes related (e.g., levels of vaccination in one’s patient pool). The Actuarial Patient Value Model is “Pay for Results.” The practitioner bonus is for “documented health improvements.” The amounts are “actuarially-determined cost savings.” Incentives are recurring. The practitioner has skin in the game to work with the patients to maintain the positive lifestyle changes as the new norm for the employee. In the quarter century of integrative activity, the idea of the self-insured employer or union – or government agency – as natural economic partner for complementary, integrative, functional and lifestyle care circles back with the apparent irregularity yet powerful glow of a comet. A few might try to embrace the corporate partner. Yet essential connections do not get made. The opportunity flies off. In his webinar, Beckman closes with suggestions for a strategy for practitioners to forge ties to employers. He shared in an interview that creating tools and supporting practitioners is core mission for ACLM’s Economic Research Consortium Advisory Board. This is the right direction. The community will need tools. A white paper to flesh out the model. A cross-cultural, how-to pamphlet on currying relationships with employers and unions. A website to teach through best practices and hosted sharing. Beckman has identified the method. His model gets the sword wiggling a bit. And the numbers in the Actuarial Patient Value Model add up nicely. Yet nothing short of a multi-year, multi-faceted campaign will release these financial rewards for lifestyle practices from the stony grip of the disease-addicted medical industry.